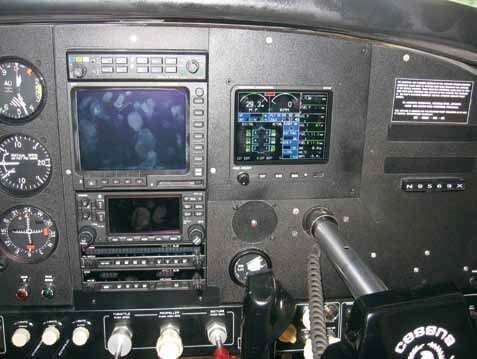 Engine Monitor Install | Tennessee Aircraft Services, Inc.
You already know you need an engine monitor and you’ve been dreaming about having one for a while. Recently you went on line to check out your favorite unit only to find the basic digital engine analyzer is old news. Now, you really must have the glass panel that replaces all those 30 year old needle gauges. A little forethought and it becomes obvious this new “all in one” box is going to be a bigger instrument panel change event than the single EGT/CHT monitor you were first determined to buy. When my Dad started teaching me to fly in the mid 1960s the only engine instruments in the planes were the minimum required by FAR. I was only 5 but remember being overwhelmed with “all those gauges.” What more could one possibly want or need? I don’t know when the term “engine monitor” came to be, but it is definitely recent history. I remember seeing an old EGT gauge in a brand M airplane with the label “Econometer”, or something really high tech like that. Alcor was the predominant brand of the day. Having a single probe EGT gauge in a plane was a nice option but not one that would particularly increase the value of the plane. A little later someone installed probes to all six exhaust with a rotary switch on the single gauge to select between the different probes. I’m not sure how valuable that was since you could only see one cylinder at a time but it was a natural progression. The next step was individual EGT gauges for each cylinder packaged in tidy vertical units. All the exhaust temps could be seen at one time and compared easily. Unfortunately, pilots had no clue what to do with this added information. Most were taught to lean using the hottest cylinder regardless of which one peaked first. Did I mention cylinder head temperature? No? Well, that’s because not much thought was given to CHT and the original factory gauge 475 degree red line was fairly easy to stay away from. If the CHT ever got to that red line it was generally too late to do anything about it anyway. To suggest keeping CHTs below 400 degrees in those days would have been just silly. I remember when the first “graphical engine monitor” was advertised. It only had electronic bar graphs with no numerical temperature displays at all. Dad said these things would be nothing but trouble. Imagine all those pilots having access to that much information about their engines and expecting all the EGTs and CHTs to be equal. What a difference a few decades make. The fact that you’re reading this article indicates you’ve probably also read lots of other articles about running your engine lean of peak, keeping the CHTs low, and other “new” style operating procedures. These new methods of engine operation are only possible with the advent of the current day version of the engine monitor. But why stop there? Why not digitize everything just like the new planes coming off the assembly line. In steps the latest in engine/systems monitors. They don’t have a catchy name yet but they monitor pretty much everything in the plane; EGT, CHT, rpm, manifold pressure, oil temperature, oil pressure, fuel flow, fuel pressure, volts, amps, and fuel quantity. Some have the flexibility to display even more. There are several of these glass panel systems, from which to choose, that are FAA approved as replacement for original equipment. Each has its own strong points and reasons for being. I wouldn’t dare think of comparing these systems and depriving you of the many exciting hours researching to determine which is best for you. What I will do is take you through some of the installation process to give you an idea of what you’re in for. 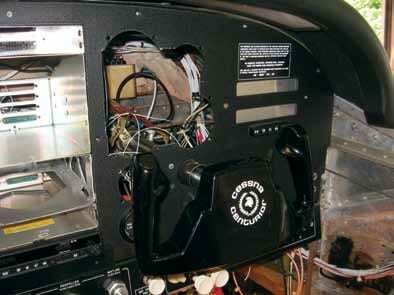 You may chose to remove the entire instrument panel to have a new one fabricated. A more practical initial approach might be to create an overlay panel for the new instrument mount. A square hole is cut in the old panel to allow installation of the new display. An overlay panel is then cut which covers all, or most, of the old empty holes while providing a mount for the new display. This is much less time consuming and less expensive than a completely new panel. After flying with the new monitor for a while you won’t feel so bad when you decide it simply must be relocated 2 inches further left and 1 inch higher. 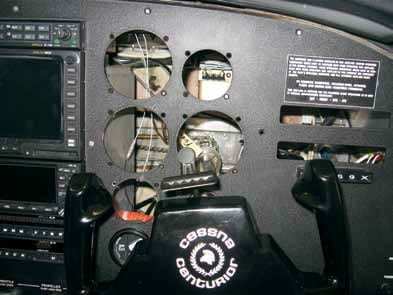 The right instrument panel of the 210B with original gauges removed. Each original wire, line, or hose will now attach to some type of sensor. 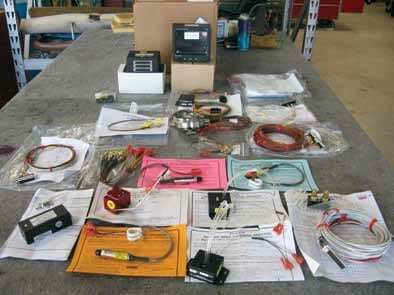 These sensors, or transducers, can be mounted in the engine compartment for convenience and added safety. The convenience is easier installation and access on the front side of the fire wall. Safety is eliminating some of the fluid carrying lines from the cockpit. In case you are unaware, the old oil pressure, fuel pressure, and fuel flow gauges have fluid lines connecting them directly to the engine. That’s just one more opportunity to reduce flammable fluids in the cabin. Most of the first generation engine monitors would be installed using electrical power from the avionics buss. The rationale being that any voltage spikes from the alternator at engine shut down would be mitigated by having the avionics master turned off. The new units have excellent built in protections and should be wired to the primary electrical buss so they are on almost any time the engine is running. Weight change with the new equipment is not as much as I had expected. We recently installed an Electronics International MVP-50 in a 210B (as you can see in the accompanying pictures). All the removed hoses, tubes, and gauges were weighed after removal and came within a few ounces of the weight of the new parts installed. A significant amount of pre-installation research and paper work is required to determine the correct limits for all the instruments. The new display must use the same markings as the original equipment. Displays that were not part of the original equipment may be marked as you like such as volt meters, ammeters, or even fuel quantity. You could add a yellow caution line from 0 to 5 gallons and a red warning at empty if you wanted to the fuel quantity display. Different vendors offer flexibility as the FAA allows. This is where that extra home work comes in so you select the box best suited to your needs. Post installation check-out is really cool. Light it up and suddenly your 30, 40, or 50 year old chariot arrives in the 21st century. Well, at least part of it. There is more work to be done in terms of calibrations and setting warning limits. The fuel level is one requiring some effort. Each tank should be emptied and the new gauge calibrated to display zero. Add 10 gallons at a time, or whatever the particular manufacturer recommends, and calibrate the new display for each added level. It is important for the plane to be level during this process. Keep in mind that even though you have a very refined display for fuel level you still have the original sending units. This definitely limits accuracy of the system so you still won’t want to rely on these for in-flight planning. If you’ve been flying the same plane for many years it may take a little while to get used to the new display. Getting that instinct to look to a specific place on the unit for that one bit of information is very different than a quick glance towards a dial. You may not realize how second nature it was to note the oil pressure was just fine because the old needle was pointing just a little right of center. Now, the bar graph and/or digital display may actually have to be read. Not a bad thing, just different. The new display mounted in a cover plate. Too cool. Having the way cool glass display will definitely cause an uncontrollable grin to spread across your face. You may not notice but your co-pilot will. The impressive look of such a device also inspires a strange elevated level of confidence in the operation of an older plane. The unknowing passengers won’t have any clue what it’s all about but they will be impressed. In flight troubleshooting of engine or system malfunctions is phenomenally enhanced with this level of sophistication. That little bump in the night can much more easily be diagnosed to determine if an immediate landing is required or simply continue to destination with confidence in the safe continuation of the flight. I like to call it informed consent. While it all looks really cool, the real reason to install one of these systems is to have precise reliable data. Precise data translates into very useful information. Taking out an oil temperature gauge with only two markings for a digital display with actual numbers is a huge improvement. Having a device to alert you when the electrical buss voltage dips below acceptable levels, giving you valuable time to plan, is a real safety feature. We often make the right decision for the wrong reason; decide to install one of these engine/system analyzers because you can make better informed and safer decisions.